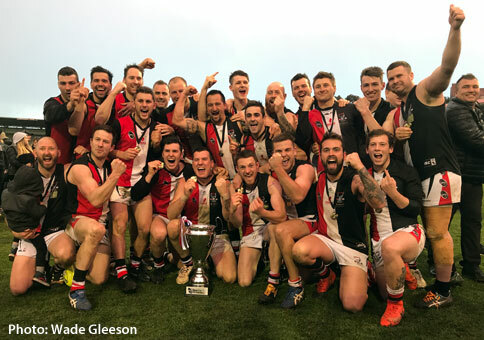 PURE elation was the reaction from Eagles players, fans and officials when New Norfolk won the SFL grand final on Saturday. New Norfolk District Football Club president Ben Shaw had tears in his eyes as his happiness and relief spilled over. Regarded as one of the best coaches in the league, Matthew Smith again proved you are never out of it. After the side trailed for most of the game, Smith - as he has done all season - showed his belief in the team. His rev-up at three-quarter time was more than motivating. After the match he thanked his assistants, trainers and officials as he presented his hardworking staff with premiership medals. Commiserations to reserves coach Robbie Iles and his side who played so well all season and put in a gallant effort in the grand final. You did your best and you all should hold your heads high. Let’s hope you all come back next year and go that one better. After winning its 26th senior flag, the NNDFC has a record that is quite astounding to say the least. Since joining the Southern Football League in 2000, the senior team has now played in 11 grand finals from a possible 18 seasons. From those 11 appearances, the team has now won seven premierships. Even more astounding is that the Eagles have played in eight grand finals in the past nine years and won six flags. Not a bad effort. Furthermore, since joining the SFL the senior team has played in 364 games including finals, and from this total, it has won 285. That's an average of just under 16 wins for every season in the SFL. There have been only 79 loses, which is an average of just over 4 losses each season. Of the 18 seasons played, the team has missed the finals on only one occasion, which was in season 2008. The figures show the dominance of this team. Well done NNDFC, your record is up there with the best. NNDFC Senior SFL Premierships: 2005, 2009, 2010, 2012, 2013, 2014, 2017. NNDFC Senior SFL Runners-up: 2000, 2004, 2011, 2015. * The NNDFC game totals have been kindly supplied by Ray Aitchison.